What a delightful church this is, and how rarely visited! Most people seek out the famous Poley church at neighbouring Boxted, but I prefer here. East Anglia has plenty of pretty villages, but few of them are as lovely as Hartest, I think. And yet it is not a well-known place. Tourist favourites like Kersey and Heydon are undoubtedly attractive, but they do not measure up to this sprawling old village set around its green in a secretive fold in the hills. In truth, south-west Suffolk is perhaps the least-visited part of East Anglia, and yet it is in many ways quite the loveliest. Hartest feels like a place where you could live quite happily without leaving it too often. It still has shops, a decent pub and even a social hall that serves as a cinema and theatre for travelling companies. It is far enough away from Bury and Sudbury for the builders of heartless new estates not to see it as a natural dormitory village ripe for development. The brutal out-of-town shopping centres are far enough away for all but the 4x4 crowd to resist. The church is a pretty thing, relaxing in a secluded graveyard on the edge of the green. Perhaps it is not one of Suffolk's more interesting or important medieval survivals, but if that keeps Hartest out of the guidebooks then all is well and good. 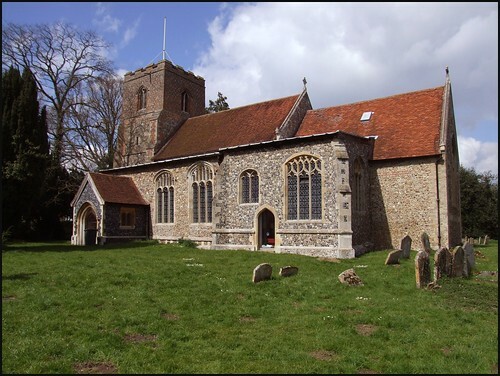 The 14th century tower top collapsed into the church during the Commonwealth, making this restoration one of the earliest in Suffolk. The interior was rebuilt lower, and a new roof was put on. Several windows and other features were reused. The curiously shaped nave (it seems wider than it is long) was reroofed again in the 19th century, when the font was also new. There is a good collection of interesting and restrained memorials, including one by Henry Westmacott that is designed to resemble a rippling banner. The Victorians reordered and refurbished the Lady Chapel to the chancel, restoring it to use, but more recently this has been beautifully redone again. The priest door has been replaced by glass, with plastic stick-on 'stained glass' - this actually looks rather good, but it would be nice to see a more permanent feature - it was there when I visited eight years ago. I love churches filled with light. I love the way the lady chapel here seems to glow with it. At the entrance beside it is a fine modern interpretation of the crucifixion. A little story to finish with. Coming back here in 2008, I found that I did not remember much about the church at all, and so I took more than my usual time wandering around the outside figuring out the architectural sequence, and then inside poking my nose into corners in a knowing manner. I had been inside about fifteen minutes when the churchwarden came in to speak to me. He was very polite and very charming, but he made it clear that he wanted to know who I was and what I was doing. It turned out that this was because there had been a spate of thefts in the area of roofing lead. Now, as I was on my bike I was unlikely to be rolling it up and taking it away, but he pointed out quite reasonably that I could have been on some sort of reconnaisance mission. We chatted for a while about the responsibility of being a church warden, and then he wandered off, leaving me in peace. Thank goodness that lead thefts don't give churchwardens a reason to start locking their churches! This is such a lovely village it would seem very strange, and very sad, not to find its church open and welcoming.